We met again for my post segment ‘one year one country’. For this year, Alhamdulilah I have un-tick my wish list ‘one year one country’ to Medan, Indonesia. As usual this is my last minute plan to go to Medan. Why Medan? Because the cheapest flight at that time, yes my definition of travel ‘murah je book terus plan kemudian’ . So for this year, Farah is my travel partner (previous post, my Phuket travel partner) as I can say, my Medan getaway is like my short honeymoon because it was so calm and I do happy for this travel. Alhamdulilah is was great and everything was so smooth. Side note: I have already booked driver (help from my Medan friend Anita, thank you I love you, if you want this driver number you can drop the comments below. I will give it) Based on my research mostly drivers will charge you about 700K Rupiah to go to Berastangi but I got this around 550K Rupiah the cheapest among all drivers so yeah. I do suggest you to hire a driver rather than rent a car because the road it is super winding and their driving skills it is super scary. I almost have a heart attack in the car. I love so much from the decor of the hotel, the ambiance, their services, their hospitality I will grade them A++ especially Mr. Agus . He is very helpful even tho he is the one miss out my booking, but is okay we upgraded to suite room. The decor’ of the hotel inspired from Japan decoration, they also provided Halal food. To be honest I love everything about this hotel. You guys can read other reviews on booking.com. 9/10 star. Mostly hotel in Berstangi without air-condition but don’t worry it is already cold here. Bring sweater. Sipo Piso is one of must go attraction place if you in Medan. It was beautiful. *They will send directly to your hotel if you book the hotel at the Tuk Tuk area, it is more cheaper and if you lucky enough it will come with lake view of Lake Toba like our room. I booked via Booking.com, at first the review was average and I also did not put high hope as my previous hotel but when we reached there, it is beyond my expectations. The room was clean, spacious, we got lake view, our balcony facing the lake view, we got our hang out area in front of lake toba, it was amazing but the Wifi only can reach at their lobby but is okay. I will rate 8.5/10. Halal restaurant only 4 mins walking it called Mami Tempo. For me Tomok is the best place for shopping, to buy songket , if you a big fan of art and craft I guess this place also the best place. The good thing I love shopping here is they will not sell the same things in other places. Which means you can’t find the things that sell in Tomok will be same at Narita either Medan. Best advice if you really love that thing, go grab and try to bid for the lowest price. *To be honest, I prefer shopping at Tomok rather than Narita. However, I do recommend you guys to buy kain harum . The smell was so nice, kain tu gosok2 baru bau. Kind of menyesal tak beli. *Bagus Taxi is a shared taxi with another person; it will be 6 people per car. For my review it is cheaper compared to the transportation we took for 3 days before. The good thing is they will send you till your destination (accommodation) really recommend eventho their driving skills so scary. You can get this Bagus Taxi counter straight away once you reached at the Raja Tiga Ferry. *To be honest, is totally not worth it because the Istana Maimun on renovation , it kind of wasting our time wandering around. But if you guys want to try their royal official traditional dress , you can rent about- 100K . It was beautiful but I am not interested. We just rest and prayer, enjoying our last day in Masjid Raya . 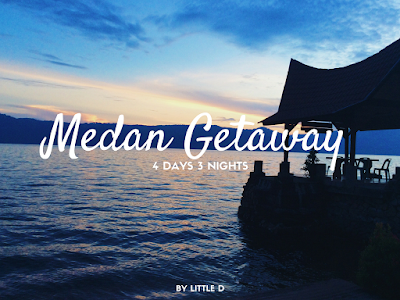 To be honest, there’s not much activity we do in Medan, because to go one place to other places is quite far and our timeline also quite limited on that day because we need to catch our flight so yeah. Overall, everything was smooth and easy . I really do enjoy my duo getaway because the place was good, not many tourists and people, you will really enjoy every moments and nature. I do feel calm and InsyAllah will visit again. The hotel choices are truly great that’s made me happy and the people in Medan are super-duper friendly and helpful. End of my journey, hope my post will gave you guys as reference or information. Happy travel!